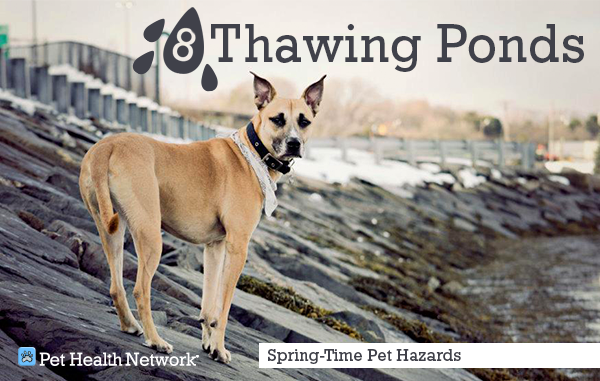 After a long winter, we’re sure that you’re ready to get outside with your dog. While we couldn’t agree more, don’t overlook these 9 hazards of the season. 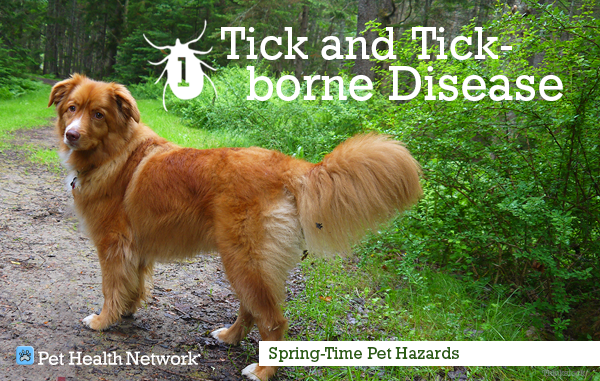 Ticks are more than just creepy; they can spread a number of different diseases that affect both pets and people: Lyme disease, ehrlichiosis, Rocky Mountain spotted fever, anaplasmosis, tularemia, and babesiosis. The best way to protect your pet is with preventative treatment. Ask your veterinarian for advice and click here to learn more about ticks and the diseases they spread. Antifreeze is extremely dangerous to pets because most types have a sweet smell and taste—dogs tend to dive right in and lap it up. 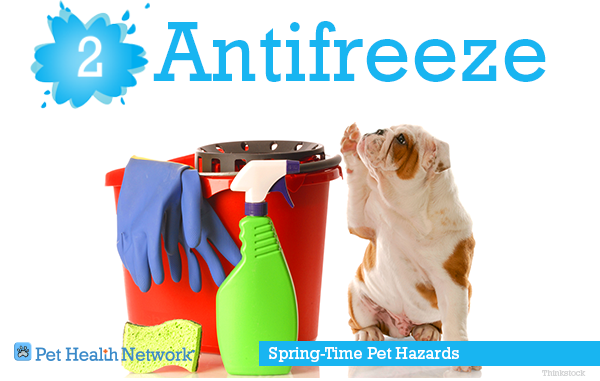 Because of this, antifreeze poisoning is one of the most common forms of poisoning in pets. Fortunately, “pet-safer” types of antifreeze that are not as attractive to pets are available. Beware, antifreeze is not the only garage hazard. 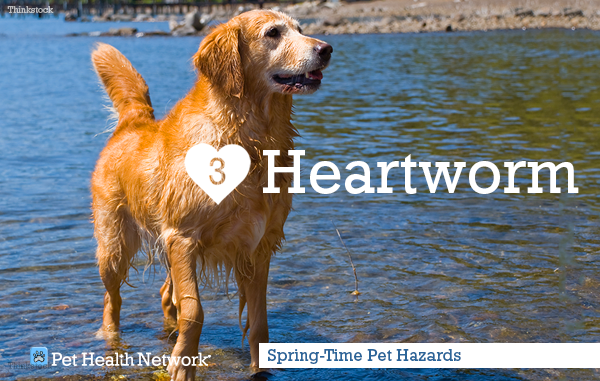 Heartworm disease is transmitted by mosquitoes. It is a serious disease that primarily affects the heart and lungs, but can also affect the liver, kidney, eyes, and central nervous system; if left untreated, it can cause death. Fortunately, effective preventatives are available. 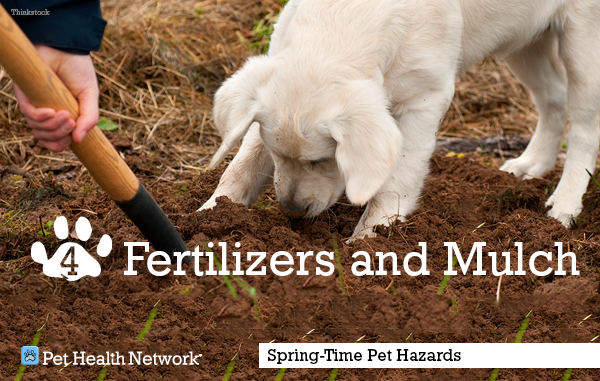 According to the PetPoisonHelpline, most fertilizers contain a wide assortment of potentially toxic substances including iron and nitrogen. They could also have pesticides, fungicides, or herbicides. Even if the chemicals don’t poison your pet, large amounts of fertilizer could result in gastrointestinal or pancreatic problems. Snail bait represents a major risk for dogs and cats and is a more common source of poisoning than you may expect. Snail and slug bait products typically contain the poison metaldehyde, and they taste sweet to pets. 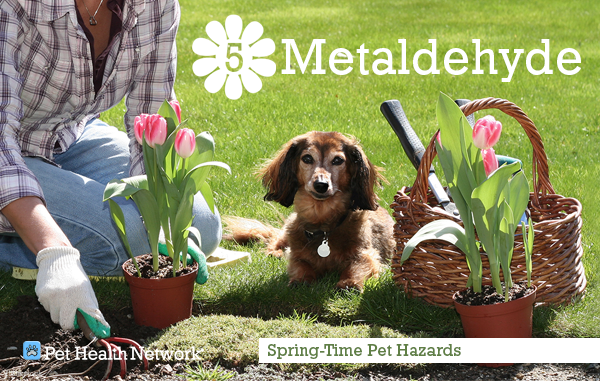 It’s important that you know the symptoms of metaldehyde poisoning in case your pet is exposed. Like people, some dogs can have an allergic reaction to bee stings, especially if stung by multiple bees. 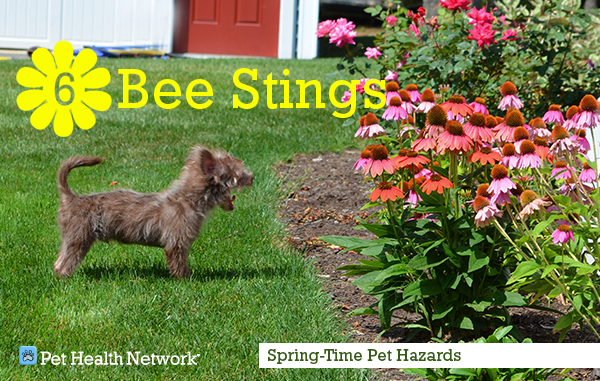 Talk to your veterinarian about how you can keep your pup safe from bee stings, and what to do if your dog is stung. There are 20 species of venomous snakes in North America, and they are found in every state except Alaska, Hawaii, and Maine. A rattlesnake can bite your dog even if the meeting is not face-to-face. Rattlesnakes can strike as far as half of their own body length. Although they usually warn before striking by rattling their tail, they don't always. Learn more about venomous snakes here. Your dog may be accustomed to taking walks over ice covered lakes, rivers and ponds. As the ice begins to thaw, the new dangers presented by exposed water are likely not going to be apparent to him. By keeping your dog on a leash you can protect him from falling through the thin ice. 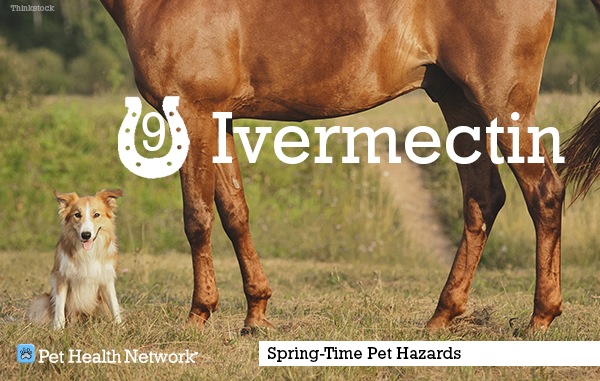 Horse dewormers often contain ivermectin; it’s also used in small doses to kill parasites in dogs. Toxicity can occur if a dog is given an excessive dose of the medication. To prevent ivermectin toxicity keep horse products out of his reach and only administer the prescribed amount of heartworm medication as instructed by your veterinarian. Learn about the IDEXX Pet Health Network contributions! Are Human Medications Safe for Dogs? Are Batteries Poisonous for Dogs?